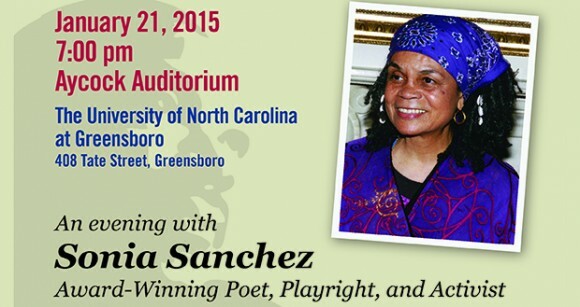 Poet, educator and activist Dr. Sonia Sanchez will deliver the keynote address at the 2015 MLK celebration sponsored jointly by UNCG and NC A&T. This year’s celebration is titled “Arts and the Civil Rights Movement: An Evening with Sonia Sanchez”. Sanchez will speak beginning at 7:30 p.m., Wednesday, Jan. 21, in Aycock Auditorium on the UNCG campus. Doors open at 6 p.m., and the event is free and open to the public. A moderated Q&A session with Sanchez follows her speech at 8:15 p.m. A meet and greet and book signing with Sanchez is scheduled for 8:30 p.m. The celebration marks the third year of collaboration between UNCG and A&T for the King remembrance. Both institutions will present MLK awards before the Sanchez address. One of the most prominent writers of the Black Arts movement, Sanchez speaks internationally on black culture and literature, women’s liberation, peace, and racial justice. Finding her voice in poetry, Sanchez evolved from a shy child with a stutter into a force of the Black Power movement of the 1960s. She was also in the forefront of the Black Studies movement and taught the first course in the country on black women. A prolific author, Sanchez has written more than 16 books, including “Morning Haiku”; “Homegirls and Handgrenades,” for which she won the American Book Award; “Shake Loose My Skin”; “Like the Singing Coming off the Drums”; “Does Your House Have Lions?”; and “Wounded in the House of a Friend”. She has also published numerous plays, including “Black Cats and Uneasy Landings” and “I’m Black When I’m Singing, I’m Blue When I Ain’t”. Sanchez is one of 20 African American women featured in “Freedom’s Sisters,” an interactive, traveling museum exhibition, which brings to life African American women who have fought for equality for all Americans. She is also a sponsor of the Women’s International League for Peace and Freedom and serves on the board of MADRE, an international women’s human rights organization that uses human rights to advance social justice. Some of her other honors include the Outstanding Arts Award from the Pennsylvania Coalition of 100 Black Women, the Community Service Award from the National Black Caucus of State Legislators, a PEW Fellowship in the Arts, and the Langston Hughes Poetry Award. The first presidential fellow at Temple University, Sanchez held the Laura Carnell Chair in English at Temple from 1977-1999. Sanchez has traveled extensively, reading her poetry at campuses across the globe. For more information, contact the UNCG Office of Multicultural Affairs at 336-334-5090.